Most commonly known as Hungarian Nut Rolls, Kolachi or Strudels, this is a popular European Sweet Bread Wrap filled with a variety of delicious fillings. Just like Barbara's Great Grandmother's Butter Cookie recipe, our Nut (mostly walnuts & cinnamon), Danish Cheese, PoppySeed & Apricot Wrap 'n Rolls re-create an old world pastry made with the same artisan ingredients & care of long ago. We've even added a modern-day variety with our Nutella & Cheese variety. 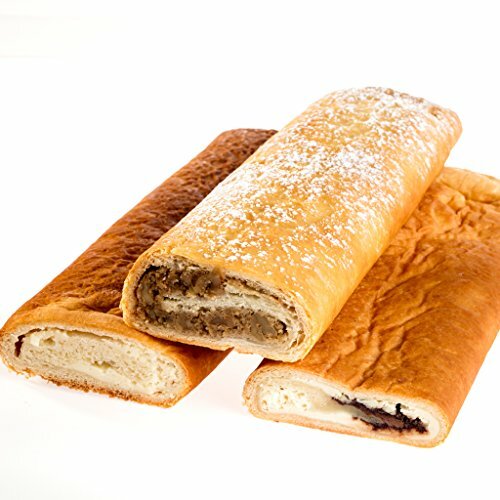 Nut Rolls are traditional rolled pastry logs of tender, delectable sweet bread that wraps a variety of sweet, rich or creamy fillings before baking. We are committed to baking and delivering the highest quality fresh baked goods. We take the extra time and care to bake Nut Rolls the old-fashioned way with fresh ingredients such as sugar, flour, eggs, milk & butter. We do not use artificial ingredients, additives, fillers or preservatives. We like them best when served warm right out of the oven, dusted with powdered sugar. Packaging: Comes shrink wrapped on a pad in shipping box. About 10"L x 4"W x 1.5"H. Over 1 lb. Gift wrapping includes a gift box, gift wrapping & ribbon. We do a nice job gift-wrapping to make the presentation extra special. Comes shrink wrapped on a pad in shipping box. About 10"L x 4"W x 1.5"H.
If you have any questions about this product by Barbaras Cookie Pies LLC, contact us by completing and submitting the form below. If you are looking for a specif part number, please include it with your message. Smart Flour Foods Ancient Grains Pizza Crust, 10 inch - 12 per case.